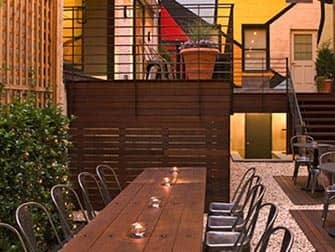 The Pod Hotel 51 in New York is a stylish and affordable hotel with a great location. It’s perfect for single travellers, young couples or groups of friends looking for a non-expensive but a cool place to stay. 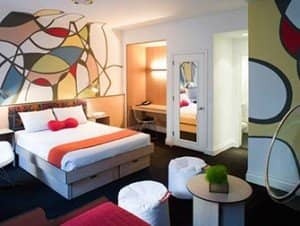 The slogan “sleep tight, stay happy” says everything about the philosophy of the hotel: the Pod Hotel 51 is all about surprising details and intelligent design, everything within a budget. 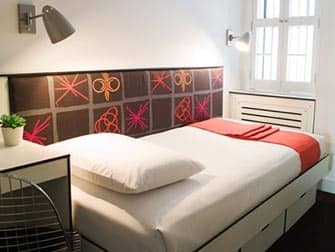 The bright rooms of the Pod Hotel 51 have everything essential and a few nice extras. They have 6 different kinds of rooms depending on your needs, most of them with a private bathroom. It’s true that you don’t have a lot of space, but the design is very good and you don’t feel cramped. 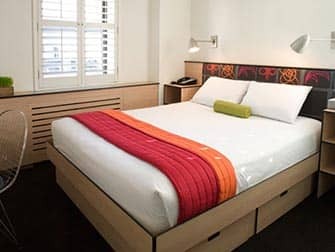 You can dim the lights and control the climate, all beds have their own flat screen, there is an iPod dock to play some music and you can keep the world up to date with the free Wi-Fi everywhere. The Pod Hotel 51 offers communal spaces as well, which compensates for the small size of the rooms. You can have breakfast in the POD café before exploring the city or grab a bite in the garden after a long day walking around. And there’s no better place than the rooftop, where you can eat or drink something while enjoying amazing views of the city. It’s seasonal, but if you go during the winter you can socialise in the POD@POD, where they serve American food and alcoholic drinks. One of the best things about the Pod Hotel 51 is the location. 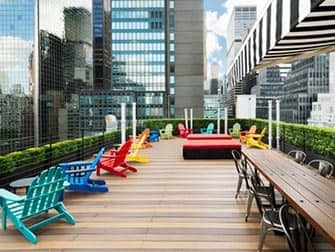 You find it in Midtown East, just 20 minutes away from Times Square and the theatres of Broadway. Grand Central Terminal is a 15 minutes walk and subway E, M and 6 stop very close to the door. Around the hotel there are a lot of shops and nice restaurants. Eric’s Tip: This hotel suits especially those travelling alone. It’s very easy to meet people there, the personnel is helpful and it’s a good value for money. If it’s fully booked, try The Pod Hotel 39.